Why do I love being a school counselor? If I had a dime for every time a parent or friend commented, “I don’t know how you do your job,” I think I could pay for my trip to the national conference with money left over to buy treats for the rest of my colleagues all over the country. My response is always, “I love my job! There is never a dull moment.” And that is the truth. Cheers, tears, and everything in between, it is a gift to be able to witness students’ growth throughout their four years of high school. I have two bins in one of my closets full of thank you notes. Seeing them reminds me of how important it is to meet each student in the moment. 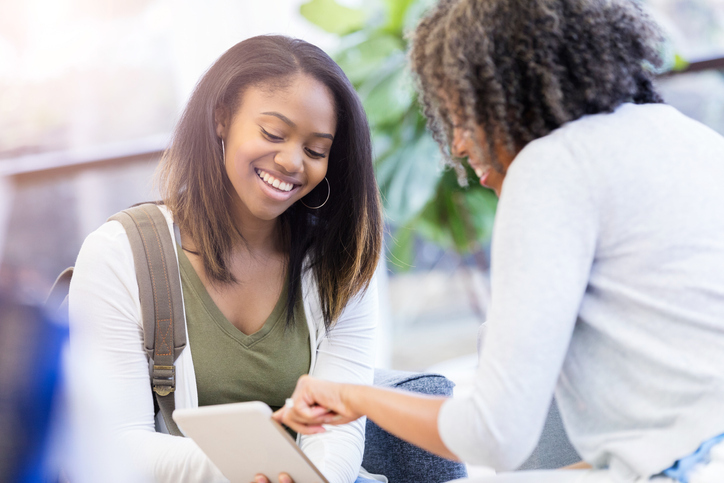 Whether they are struggling with a relationship at school or home, celebrating a college acceptance or scholarship offer, attempting to budget and accommodate college costs, or trying to figure out how to improve their grades and/or test scores, each encounter is different and unique — just like our students. The months leading up to graduation, this can be true. Whether the seniors have “checked out,” are maneuvering to pull off pranks, crying because they don’t want to leave, or angry to make it easier for them to leave us, at graduation I always tear up; I do have a hard time saying goodbye. When alumni come back to visit it is so fun to see the joy that they have about their lives. And when I am contacted by those former students who are having difficulties, it is a privilege to be there to help them navigate the support to get them on a better path. Walking into school each day, I don’t know what my day will be like. Any plan that I think I have for a schedule is changed more often than not. A meeting that I think will be a quick check-in with a student can turn into a long one trying to help them fix problems. But it is fun! We laugh, we cry, we disagree, we discuss. The students are the reason I love being a school counselor. They are incredible humans who give me hope for our future. NACAC Member Laura Docherty is a college counselor at Fenwick High School (IL).